odern Vehicles are Computer Controlled. It's not unusual today to find even a mid range car contains around 15 computers or controllers. These computers control Engine Management, ABS, Traction Control, Climate Control, Instrument Cluster and many more. Approx 20% of the manufacturing cost of a vehicle is the electronics, wiring and associated systems. Properly trained technicians are highly skilled professionals. As motor vehicles become increasingly complex and sophisticated, it is vital to you, the motorist, that you can be sure the person working on your vehicle is fully competent to do so. 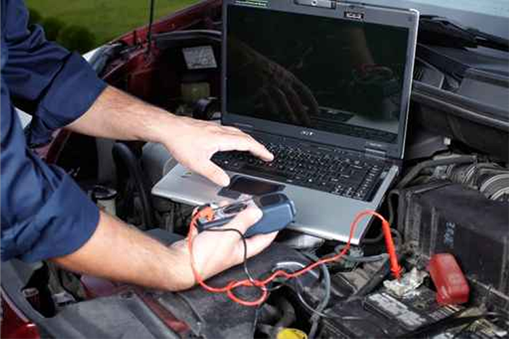 GFM Diagnostic Services use the latest "State-of-the-Art" electronic equipment and Gordon Fairnie is a fully registered member of 'The Institue of Motor Industries' (IMI) giving you the confidence that your vehicle is in capable hands and assuring quality of service. We don’t just carry out work for the general public, we carry out work for many local garages and main dealers. We diagnose and repair engine management faults that other repairers and main garages may find difficult. We also repair ABS and airbag systems.